Wine apps used to run fine in Unity 7 (7.5.0). They still run fine in Gnome Shell (3.28.3) except they are not recognized as windows. Which means: I can click and interact with everything inside the app (including menus) but not the window itself (I can't drag the title bar, can't user Super+Click or Super+ArrowKey to move the window). The Gnome Shell title bar never recognizes the launched wine app and will show nothing in the place where the application title should be. I also can't use Alt+Tab - the Wine app always stays on top (and can be clicked inside) while the active window (as shown in the Gnome Shell title bar) changes. I assume this isn't a bug since I can't imagine that Wine is broken/unusable for all Gnome Shell users, so: what am I doing wrong? In a console, type winecfg then enter. This will open the configuration tool of wine. (I think that if you type "wine config" into gnome search bar, you might also get a "Configure wine" app, it's the same). 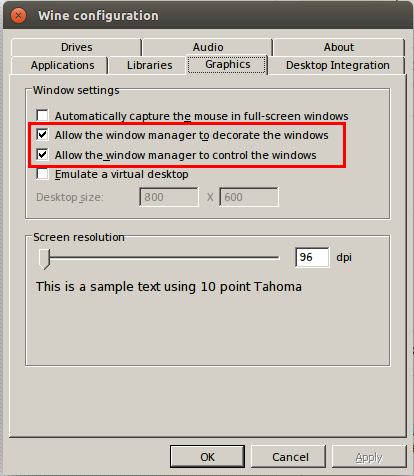 Under "graphics", make sure "Allow the window manager to decorate the window" and "Allow the window manager to control the window" are checked. You have to do that for all wineprefix you use. Not the answer you're looking for? Browse other questions tagged gnome wine gnome-shell window or ask your own question. How do I make a wine application start on another screen? How to not always show left Ubuntu Dock in gnome-shell?